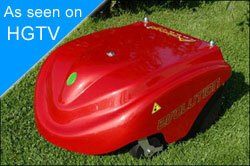 The Lawnbott Evolution Robotic Lawn Mower will take care of your lawn without you having to lift a finger. Advanced programming allows the unit to customize its schedule to you lawn mowing requirements. This is truely automatic robot with full scheduling options and a remote control.